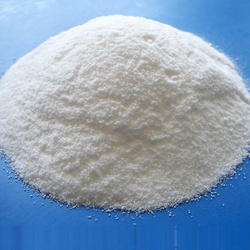 We are a leading Manufacturer of meat tenderizer powder from Surat, India. It is about basic bio-chemistry to beat and soften hardest meats. Meat tenderizer works by breaking down the bonds between the cells of a piece of meat on a chemical level. Enzymatic meat tenderizers are made of Papain and Bromelain which work synergistically to give the tenderizing effect both are of plant origin and are proteolytic enzymes called proteases. These enzymes break down the peptide bonds between the amino acids found in complex proteins. Their collective action makes the meat softer, since one of the main things holding meat together is the complex protein called as collagen, is broken down. Thus the final preparation is easily digested. Meat Tenderizer is sprinkled on uncooked meat, they can soften it within minutes, and it can be used both in marinades and independently. Tenderizing meat can make it softer and improve its texture. It also makes it easier to cut and can often cut cooking time. Additionally, it may be necessary for some recipes that call for meat to be all one thickness, and can ensure that meat cooks evenly. Inhalation of dust or aerosols may induce sensitization and may cause allergic reactions in sensitized individuals. The product may create easily inhaled aerosols if splashed or vigorously stirred. Spilled product may dry out and create dust. Spilled material should be flushed away with water. Left over material may dry out and create dust. Contaminated cloths should be properly washed. Looking for Meat Tenderizer Powder ?